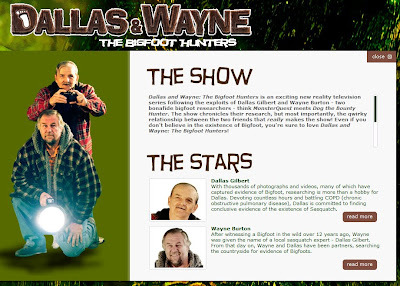 Dallas Gilbert and Wayne Burton, two real-life Bigfoot researchers starring as themselves in a semi-fictional story providing a look into the trials and triumphs of life in the Apalacian foot hiils. Through these two amateur BF researchers from southern Ohio, we see how the power of a dream can define a friendship and provide hope and a meaning that transcends the harsh realities of life in a dying steel town. After several failed attempts to attract national attention and convince the world Bigfoot exist, Dallas catches a lucky break. He pursuades a high-profile Bigfoot researcher [Tom Biscardi] to stop in Portsmouth and see check out the research accumulated by Dallas and Wayne. As the movie accelerates ever closer towards the realization of their mutual dream, we are reminded how fragile this shared hope truly is. The movie turned into a TV series titled Dallas & Wayne: The Bigfoot Hunters. You can watch video of the season two premier episode below. Wow--I didn't catch where the show is shown. I am happy. I loved these guys in the documentary and I wondered what ever happened to them. They are so adorable. Glad to see they're still making loads of contact with BF (smile). While I really like these guys (my type) and I did watch their movie, they like the "finding big foot team" are going about it all the wrong way. Do you think these "animals"/ are just plain dumb? Do you they yelling and wood knocking will attract them in? No! it repels them! The reason why 90% of big foot researchers never have much luck it because they still adopt and use these outdated methods. During their climb up that hill, do you think "if" any were around they would just stand there and watch these fat out of shape smelly humans come up to them? They must have sounded like a herd of Elephants coming! Shurale — A Tatar Yeti? Finding Bigfoot: What Does Bigfoot Look Like?